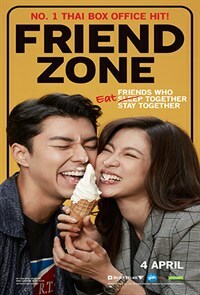 Movie free listed from 11 April 2019. Palm (Naphat Siangsomboon) is one of those who has been stuck in the friend zone with his best friend, Gink (Pimchanok Luevisadpaibul), for 10 years. During high school, he tried to cross the line by confessing his feelings for her. But Gink simply rejected him, saying that “being friends is good enough.” Since then, Palm and Gink have grown closer as true best friends. Every time Palm breaks up with any of his countless girlfriends, Gink will tell him off, talking some sense into him. And every time Gink fights with her boyfriend, no matter where she happens to be in Myanmar, Malaysia, or Hong Kong. All she has to do is make a call to Palm, who uses his perks as a flight attendant to catch flights to be with her.